Ribbon: Baronets of Nova Scotia - orange-tawny; all other Baronets - orange-tawny with blue edges. The ribbon is not worn when ribbons only are worn. 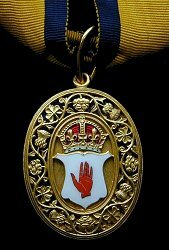 Instituted: 1624 for Baronets of Nova Scotia by James I; and in 1929 by George V for all other Baronets. 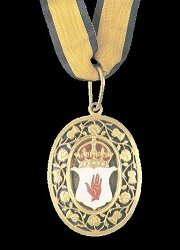 Awarded: Not an award as such, but worn by holders of the hereditary title of Baronet. 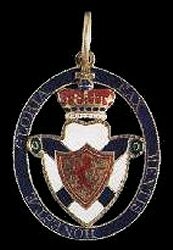 Grades: 1 - the badge differs between Baronets of Nova Scotia, of England, of Ireland, of Great Britain and of the United Kingdom. Baronets are called 'Sir' and may distinguish themselves from knights by the addition of 'Bt' after their names.